Lynn Peterfreund is showing ten prints from her series of large “sky” monotypes. The series was inspired by what a crow might see and feel in our rapidly changing world. 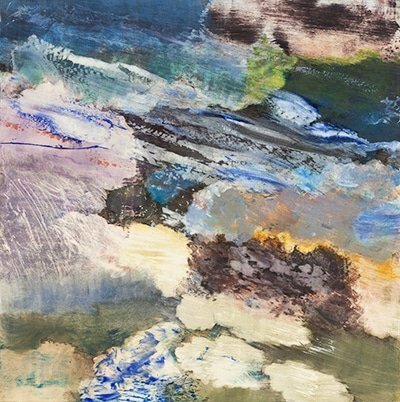 Early in the process of making these prints, the crow flew off, leaving images of clouds and movement of heightened and invented color described with gestural monotype marks and many layers of transparent color. Peterfreund’s Sky prints capture an emotional and literal turbulence with moments of calm and quiet.